ChrisWeigant.com » Friday Talking Points  -- Revive The "No Budget, No Pay Act"
Friday Talking Points  -- Revive The "No Budget, No Pay Act"
Eric Cantor, much to our surprise, almost just did something we not only would have agreed with, but in fact given our wholehearted support to. Almost. In the midst of caving in to President Obama on the whole debt ceiling fight, Cantor tossed out a proposal (likely, to distract attention from his giant cave on the debt ceiling) which, at first glance, sounds great. We must pay our bills and responsibly budget for our future. Next week, we will authorize a three month temporary debt limit increase to give the Senate and House time to pass a budget. Furthermore, if the Senate or House fails to pass a budget in that time, Members of Congress will not be paid by the American people for failing to do their job. No budget, no pay. Cantor is then backed up by John Boehner, who also bluntly states: "The principle is simple: no budget, no pay." I was all ready to jump on board, at this point. After all, I've written (on multiple occasions, since 2007) previous articles with the same basic title: "No Budget? No Pay!" Unfortunately, later on in the news article appeared an unattributed statement (from a "leadership aide") that "if the House were to pass a budget and the Senate did not, House members would still get paid but senators would have their pay withheld." Up until this point, I thought they were serious. This statement, however, means they are not. They are just playing politics, and bad politics at that. Because a House budget that doesn't make it through the Senate does not count, guys. Sorry. A House budget that cannot pass the Senate is, by definition, a political stunt, not "a budget." But this does open up a wonderful opportunity for Democrats. Instead of this fake "no pay" idea, Democrats should get behind a real bill that would indeed do what Cantor and Boehner are trying to pretend their new idea does. In the last session of Congress, the "No Budget, No Pay Act" was introduced in both the Senate and the House. It got 14 cosponsors in the Senate, and a whopping 80 in the House (search the bill-tracking site at the Library of Congress for "H.R.3603" or "S.1981" from the 112th Congress to see the cosponsor lists). The NBNPA (as I'm going to call it from now on) fully complies with the Constitution (Cantor's idea does not). It would not go into effect until after the next election, as the XXVIIth Amendment dictates. And it has real teeth -- both houses of Congress would have to pass a budget in order for anyone to get paid. Cantor's idea is no more than a stunt -- so the House Republicans can pass some laughable nonsense they call a "budget," knowing full well the Senate will never agree to it, and then they'll continue getting paid while denying the Senate paychecks. That right there is never going to pass the Senate, much less be signed into law. Any "no budget, no paycheck" law has to address the real problem: the inability of both parties in both houses of Congress to get their act together, negotiate, and hammer out a compromise. If Democrats were smart, they'd co-opt the slogan at the heart of Cantor's flim-flammery, and make a huge push for enacting a real "no pay" law, instead of this cheap gimmick. It's one of those things which politicians hate, but will be wildly, insanely popular with the American people. If Democrats fail to take up this challenge, they risk Cantor and Boehner scoring political points on the issue with nothing but smoke and mirrors to back them up. Democrats: call their bluff! Revive the NBNPA and push it hard! This past week saw official reactions to the slaughter of innocent children in Newtown, Connecticut. Two Democrats stood out this week, one on the state level and one on the national. While President Obama got the spotlight for announcing his list of proposals about what to do about curbing gun violence, he only gets an Honorable Mention for doing so. Instead, the coveted Most Impressive Democrat Of The Week award goes to Vice President Joe Biden, who was in charge of the task force which put together the recommendations. This task force reacted with blinding speed, by Washington's standards. In a single month, they held all their meetings and came up with their list of ideas to present to Obama. Normally, in Washington, any blue-ribbon commission would still be figuring out who will sit where at the table, and be ordering their office supplies. Normal commissions of this type usually take -- at minimum -- six-to-nine months to do anything productive. Taking whole years to do something is not even out of the question. Biden, instead, ran a tight ship. He got people together, heard ideas, and then put together an incredibly comprehensive list of possible governmental actions. So comprehensive, in fact, that even some critics of gun control had guardedly good things to say about some of the ideas proposed. Nobody knows how effectively the ideas will be implemented (even the ones that don't have to make it through Congress), and nobody knows how effective any one particular idea will turn out to have been, but the list Biden came up with seems to have been based on "let's try a little bit of everything," which probably sounds pretty good to the American public right now. On the state level, New York's Governor Andrew Cuomo also must be awarded his own MIDOTW, for equally-blinding legislative speed. New York passed the most strict gun control laws of pretty much any state, and they did so this week as well. That's not just a commission's report with suggestions, that is actually getting a bill written, passing it through the state legislature, and getting it signed into law -- in the space of one month. For such quick action -- and for such bold action in the law's provisions -- Cuomo also qualifies as Most Impressive Democrat Of The Week. Remember his name, folks, you may be hearing it in a few years on the presidential campaign trail. Congratulations are in order for both Governor Cuomo and for Vice President Biden, not only for their actions in dealing with the problem of gun violence, but also for the incredible speed with which they did so. This week, the Most Disappointing Democrat Of The Week award is given not "in sorrow," but rather "with amusement." President Barack Obama's White House has been revolutionary for many reasons, one of which is improving online access for the American people. Specifically, the concept that people can propose questions to the White House, and if they get enough support from like-minded folks, the White House is bound to provide an answer. Up until now, this limit has been getting 25,000 digital signatures within a period of 30 days. This week, however, the White House announced it was considerably upping this bar -- by a factor of four. Henceforth, 100,000 signatures will be necessary to generate an official response. Boo! What are you trying to do, take away our fun?!? The story is probably best told as comedy. The White House is (quite likely) tired of wackadoodle questions that a surprising number of Americans want to see officially answered. The most recent example was not the question of secession (which, after all, is a very serious subject), but rather the proposal that America immediately begin constructing a Death Star in space which is capable of blowing up planets, as shown in Star Wars. This question easily got the 25,000 signatures it needed. The punchline was how the White House began its response: "This isn't the petition response you're looking for." Heh. Jedi mind tricks from the White House -- how cool is that? But what they obviously meant was: "This is not the sort of petition we are looking for." The online community has always appreciated a good joke -- the geekier the better, in fact -- and there are plenty of hilarious things you can dream up which would be fun to see a White House response to. Because the Obama White House came up with the idea in the first place, it's not surprising that they have had to adjust it slightly over time. Still, the fact that we won't have as many of these hilarious questions asked of the White House in the future is disappointing, to say the least. There is precious little humor emanating from Washington as it is for a poor pundit to write about, and we'll miss the "Death Star" type questions that never achieve the 100,000-signature threshold in the future. So for whatever White House office made the decision to up the limit, we award this week's Most Disappointing Democrat Of The Week award. Way to spoil our fun, guys. We've got a special offering this week. We're reaching all the way back to "Friday Talking Points " (originally published January 23, 2009) for our talking points this week, to check in four years later with the ideals President Obama expressed in his first Inaugural Address. Back then, we identified these seven excerpts as those that would stand the test of time and be remembered in the future. Since we're now in that future (wondering, as we always do, futuristically... where the heck are the flying cars we were promised? 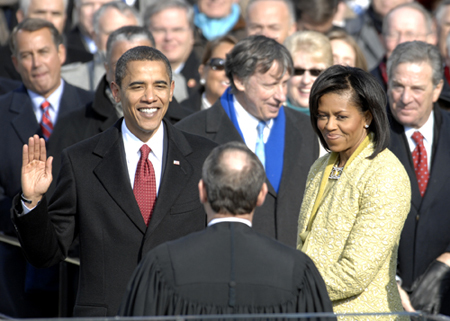 ), we can now revisit what Obama said upon his first swearing-in as our Chief Magistrate (as they called it in the past), and see what holds up and what doesn't. The first thing you'll notice, reading these, is the overwhelming sense of optimism. Looking back, it's hard to escape the term "naïveté," in fact. Obama really, truly believed he could get the Republicans to work with him. He honestly thought he could change the polarized culture of Washington, almost single-handedly. He was, obviously, completely wrong on that one. In fact, it took him an almost painful amount of time to realize it (until, say, about mid-2011). Over and over again, he tried to compromise with Republicans in an effort to gain some support, and over and over again his proposals were rejected out of hand. The second thing worth noting here is what a different place America is in economically right now than we were when he gave this speech. We were in the midst of an utter fiscal and economic collapse. Things were getting worse by the day. We were losing an astounding 750,000 jobs per month. Things are not perfect, four years later, but the trends are all good and heading in the right direction now, instead of into the abyss. Just keep in mind the dire straits we faced back then when reading Obama's words. The last thing is the change in Americans' attitude towards foreign policy. War was a big issue during the 2008 campaign. The "War On Terror" was still at the forefront of the discussion. In 2012, foreign policy was barely even mentioned on the campaign trail. That's a big shift. We're out of Iraq, and we're accelerating our planned withdrawal from Afghanistan -- our nation's longest war, ever. In any case, in preparation for Obama's second swearing-in ceremony next Monday, here are the excerpts I thought would endure from his first. The HOUSE did it's job so they should be paid.. They shouldn't be penalized if the Senate still refuses to do IT'S job.. The fact that Democrats and the POTUS hasn't passed a budget in year **IN VIOLATION OF THE LAW** is somewhat noteworthy, wouldn't ya'all agree?? Now, I am not the political giants ya'all are... I am a simple knuckle dragging ground pounder.. But I DO know common sense.. The House does it's job how the House does it's job.. So, why is it any difference when the Republicans hold the House??? I'll get to your TPs in the morning.. Just wanted to go on the record on this point.. If the House does it's job, they deserve to get paid. That right there is never going to pass the Senate, much less be signed into law. Any "no budget, no paycheck" law has to address the real problem: the inability of BOTH parties in both houses of Congress to get their act together, negotiate, and hammer out a compromise. Oh, no, you're wrong on this one. Say Cantor's law passed. The House passes a GOP "budget" and the Senate passes a Dem "budget," and both go home. So they both should be paid? How does that change anything from what we have now? If the law doesn't say "a budget which passes both Houses and is put on the desk of the president" then it is nothing more than partisan posturing. Sorry. That reality just can't be spun. California -- by citizen's initiative -- passed a REAL law. No budget -- a REAL budget, mind you -- then, no pay. We used to wait like SIX TO NINE MONTHS from the due date for a budget. Do a web search on "CA IOU" to see what happened. It was ugly. We passed a law. The first year, they tested it. Their pay got cut off. 12 days later, we had a budget. Since then, I don't think they've been late FOR A SINGLE DAY, even once. These laws work. But they have to have teeth. Oh, and by the way, the Senate passed a "Continuing Resolution" each year, and Obama signed it, a loophole in the law, but not as bad as you suggest. I really did miss Nagin, I'll get him next week, promise... you know I nail these guys when I notice them, right? I see your point and it is a valid point. How is the House cutting the Senate's paycheck?? The House DID it's job?? If the Senate would do theirs, then they would get paid.. I mean, seriously. The Democrats in the Senate havn't even ATTEMPTED to do a budget in YEARS!! Because they don't want the American people to know how they are spending OUR money!! No matter how you spin this, the Democrat Senate is violating the law AND screwing over the American people at the same time..
And yes, the same thing would be said about Republicans if THEY were doing the same thing.. I am all for your idea. Hold the luser's paychecks until they do their jobs!! This isn't (or rather, SHOULDN'T) be a partisan issue..
EVERY Weigantian should be chiming in and holding ALL of our political leaders responsible for this gross negligence..
As part of a proposal to raise the debt limit for three months, the House GOP would suspend pay for members of Congress unless both the House and the Senate pass a budget blueprint for the next fiscal year. But, apparently, there is a Constitutional issue with such a move..
We had completely missed the opening line of the Death Star response b/c we so enjoyed the 3 responses. Thanks for pointing that gag out, it was the best of the bunch. Going to your intro, Dems in the House need to vote present on the debt ceiling proposal. If the House GOP is going to pull a stunt (and repeat the debt-ceiling fiasco again in 3 mos), then a majority of them should actually have to vote to raise the debt ceiling, regardless of any attached additionals. To touch on whether or not a NBNPA is a good idea, can you imagine any budget that gets through the Senate (60 votes), the House (GOP), and the WH (Obama compromising) being one that sustains progressive values? The federal gov't seems to be capable of running w/o a budget. It isn't pretty, but it does follow the inertia laws (ertia?). At the moment, I'd go with this. So, breaking the law isn't any big deal, as long as it works?? Another example of there is really no daylight between Republicans and Democrats.. I am also constrained to point out that, by not producing a budget, the Democrats are not telling the people how their money is being spent.. I though ObamaCare/Tax was supposed to BRING DOWN health care costs, not make them rise??? No budget no pay seems sensible and of course it must be a budget that passes through all Chambers, otherwise it isn't an actual budget. It's pretty pathetic that you have to resort to these sort of measures to get lawmakers to work together though. Really sad. And yet, it's the REPUBLICANS who are proposing it and it's the DEMOCRATS who will kill it..
No way my Guvment is telling me to pass a budget. Next thing they'll be telling me is I have to eat broccoli! Where will it end! This is just more Obama Guvment taking over. He is a dictator. Someone needs to stop him. That's what's so hilarious about discussing things with you, Michty.. If I understand this correctly, the House could pass a budget because they have a majority and only a majority vote is needed to pass something through the House. However, Republicans could filibuster in the Senate, no? This is the reason so many things haven't been able to pass through the Senate over the past 4 years. As such, this proposal seems like a deliberate political move by Republicans. If they were serious and no one got paid unless a budget were passed by Congress, I'd be for it. But trying to show that one side isn't doing their job by putting them in a situation where they can't do their job is politics of the most ridiculous kind. Why do we bother giving Democrats a majority if they STILL don't get anything done??? Or the House Republicans could pass a budget called 'The House Obama Budget' and the budget has 1 line: "All Registered Democrats are to be taxed at 100% rate and punched in the face." Once it is safely through the House their pay-checks are secured and it doesn't matter that neither the Senate nor Obama would sign it into law. Maybe Democrats should pull one over on those sneaky nefarious Republicans and actually PASS this NO BUDGET/NO PAY legislation!! Wouldn't THAT really stick it to to this evil baby-eating Republicans, eh!!?? I think they should pass it - as long it stipulates that a budget must be passed (not 'passed through 1 Chamber) before they are paid. So, even though Republicans are doing EXACTLY what CW has said should be done, it's STILL just a nefarious trick. But that's just it, Michale. They're not. If it were dependent on an approved budget through both chambers, I'm all for it. It looks like the tough-talking-left-of-centre 'Speaker Obama' came out today to gave an inauguration address, putting the always-caving-compromising-right-of-centre 'President Obama' out of sight... At least for 1 day. Yep. Hopefully there is more of this now that he's not worried about getting re-elected. That's how the legislation is written.. It's not quite the same. Looking at #9. All this says is that the House must pass a bill and the Senate must pass a bill. It doesn't say they must work together to pass the same bill. Lemme know when it says they need to pass the same bill. We probably should make sure they pass it on a TUESDAY and NOT a Friday and make sure the moon is full, not a quarter moon..
No, actually one doesn't have to wonder it all..
Lol Michale come on use your head. OF COURSE they must pass the same (what would be a compromise) budget otherwise the WHOLE THING IS POINTLESS. What is the point in forcing the Republican run House to pass a Republican budget then the Democrat run Senate to pass a Democrat budget? Neither of which will pass the other Chamber and both be a complete waste of time. If you want to force this then at least call your bill the 'Let Congress Continue To Waste Their Time (And Taxpayers Money) On Legislation That Has Zero Chance Of Becoming Law Act' (LCCTWTTATMOLTHZCOFBLA for short) instead of 'No Budget No Pay'. Or as CW put it "Any "no budget, no paycheck" law has to address the real problem: the inability of both parties in both houses of Congress to get their act together, negotiate, and hammer out a compromise." The Republicans DID say that both the House and the Senate must pass the Budget.. It's ya'all who are being nitpicky and saying, "Well, they didn't say the "SAME" budget.."
The GOP is onboard with the NB/NP legislation..
Would it REALLY kill ya'all to give them SOME credit??? Ya'all are doing EXACTLY what you accuse Republicans of doing. Ya'all have stated that Obama could give the GOP everything they want and they would STILL be against it..
Well how is that any different than ya'all are acting?? Republicans have taken a page from CW.COM and put it into legislation..
Oh wait... wait.. I know.. If Republicans are supporting the latter, CW and almost everyone who has posted supports this. Myself I don't see Republicans supporting the latter, I think they support the former and are just using this as a political stunt (shock, horror!) like the fake 'Obama budgets' and all the other political stunts they use surrounding the budget. If Republicans have changed their tone to the party of Government decreeing that a budget must be passed and that parties must compromise - good for them. I'll believe it when I see it. Hahahahahah. If they don't pass the same budget, it has no meaning my friend. Remember School House Rock? A bill can only become a law if it passes both houses of Congress. Of course they meant the SAME budget!! Ya'all are doing to the Republicans EXACTLY what you accuse Republicans of doing to Obama. It's all Right v Left... That's all it is.. Shock, horror - it was all a poltical stunt. (Most sarcastic voice ever): I am so surprised. Yea, but if DEMOCRATS had done the EXACT same thing, ya'all would be swooning..
Don't bother denying it.. We both know it would be true..
Yea, but if DEMOCRATS had done the EXACT same thing, ya'all would be swooning. Ok, kidding aside, though a lot of this budget talk is a political stunt, it might actually not be bad for Democrats. If you think about it, who's blocked most legislation through Congress in the last 4 years? This has largely worked because the mainstream media never mentions how obstructionist they've been. Now if Republicans insist that something gets done and then actively work to block it (by filibustering, for example), this might draw a good deal of media attention. Again, I think there's lots of ways in which this could backfire for Republicans. What about bad for the country?? Shouldn't that be the FIRST priority?? And Party agenda be a distant DISTANT second?? ?